We designed this Africa Family Vacations: Namibia Highlights Package for some of our repeat clients, a family of 4 who had previously traveled with us to Kenya and Tanzania. They were looking for something different, so we suggested Namibia. This sparsely populated, desert-covered country is certainly unlike anywhere else on earth! We designed this itinerary to show them all the highlights of Namibia, with a wonderful private guide throughout their trip. They traveled through the country in their own air-conditioned vehicle for the ultimate comfort. The first stop on their Africa Family Vacations: Namibia Highlights Package was the Namib-Naukluft National Park region—home to the famous Sossusvlei and Deadvlei, this is a must on any trip to Namibia! They explored towering red sand dunes and fascinating clay pans filled with the still-standing remains of ancient trees. They stayed at Kulala Desert Lodge, which has its own private entrance to the park. Next, they drove along the coast to the lovely seaside town of Swakopmund. Here, they went sandboarding (a highlight for the 2 teenaged kids!) and took a cruise to see the marine life, including Cape fur seals, dolphins, and flamingos. Continuing their Africa Family Vacations: Namibia Highlights Package, they traveled to the border of the world-famous Etosha National Park for an African safari. This unique safari park is dominated by a massive salt pan, and its arid climate means wildlife like lions, rhinos, desert-adapted elephants, cheetahs, and more all concentrate at the waterholes, making them easy to spot. With few crowds, the sightings at Etosha are incredible! Our clients explored the park with their private guide and got some amazing wildlife photos. 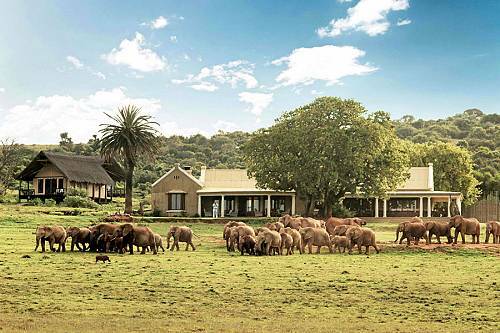 Their safari lodge also had an active waterhole where they were able to watch the game come and go in the evening. 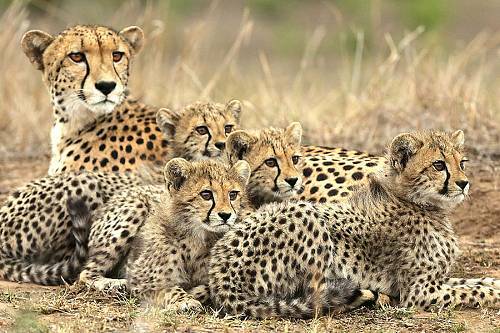 With their Africa Family Vacations: Namibia Highlights Package, they visited the AfriCat Foundation and went on a game drive to see the leopards and cheetahs being rehabilitated there. Then their guide dropped them off at their hotel in Windhoek, where they spent a night at a cozy B&B before catching their flight back home. Welcome to Namibia! Fly into Windhoek, where you’ll meet the private guide who will accompany you for the duration of your trip. Your guide will pick you up at the airport and drive you to your accommodations. Head southwest through the scenic Khomas Highlands before heading down the Great Escarpment into the Namib Desert, stopping for a picnic lunch at a scenic location along the way. Arrive at Kulala Desert Lodge, your home for the next 2 nights. Time remaining this afternoon, your guide will take you to visit the nearby Sesriem Canyon. Or, if you prefer, you can simply relax and soak up the scenic tranquility of the lodge. 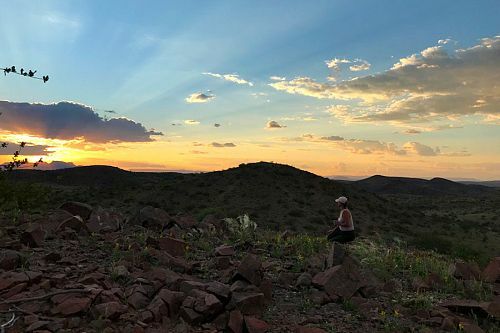 Rise early today for a visit to the famous Namib-Naukluft National Park—home to the world’s highest sand dunes, which are highlighted beautifully by the early morning light. Escape the crowds using Kulala Desert Lodge’s private park entrance. Climb the red-hued sand dunes and run down the other side to Deadvlei, a striking white clay pan where the remains of ancient trees stand in stark contrast to the surrounding dunes. Once you have explored Sossusvlei, Deadvlei, and surrounding dune fields to your heart’s content, you can enjoy a relaxed picnic brunch in the shade of a camelthorn tree. Return to the lodge in the afternoon and enjoy the rest of the day at your leisure. You have the option to take a scenic hot air balloon flight over Namib-Naukluft National Park this morning (additional cost). After breakfast, drive to Swakopmund. The fascinating drive takes you northwest through awesome and ever-changing desert landscapes, including the impressive Gaub and Kuiseb Canyons. Hit the coast at the port town of Walvis Bay and continue north to Swakopmund, where you can enjoy the pleasant seaside location and cooler coastal air for your next 2 nights. There’s time this afternoon to explore the town and wander along the waterfront on foot, before heading off for dinner at a popular restaurant specializing in fresh seafood. Today is yours for the making! Optional activities (additional cost) include kayaking or boating in Walvis Bay to see Cape fur seals, dolphins, flamingos, and possibly whales; camel rides; sandboarding; or scenic flights. Continuing on your safari today, the road takes you north to the border of Etosha National Park, Namibia’s top safari destination. Depending on your arrival time, you can head inside the park this afternoon for a game drive with your private guide. 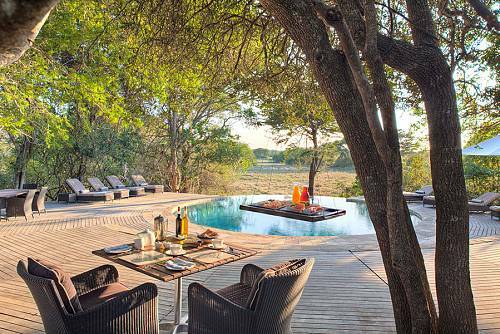 Your fabulous lodge this evening includes air conditioning (a rarity in Namibia), a pool overlooking an active waterhole, and night game drives in the private Ongava Game Reserve. Enjoy a full day on safari in Etosha National Park in a private safari vehicle. You’ll have the chance to see elephants, lions, giraffes, rhinos, wildebeest, zebras, cheetahs, honey badgers, and more. Depart the park before sunset and freshen up before a delicious dinner. The rest of the evening can be spent game viewing at the lodge’s floodlit waterhole, where game comes and goes throughout the night. Depart early this morning for a visit to the AfriCat Foundation, a wonderful highlight with which to end your trip. This sanctuary is a rehabilitation home for cheetahs and leopards, which you’ll be able to see on a game drive through the concession. Tour the AfriCat Day Centre to learn all about the conservation work going on here, then hit the road again, driving south to Windhoek. Your guide will drop you off at your hotel and say goodbye this evening. Your Namibia adventure comes to an end today. Enjoy a private transfer to the Windhoek airport, where you’ll begin your journey home.